Compound A has molecular formula C6H12O and shows a sharp peak at 1,710 cm-1 in its IR spectrum. Treatment with 1 equivalent of phenyl Grignard yields compound B, which has formula C12H18O and whose IR shows a broad peak at 3,350 cm-1. Compound B's 1H NMR spectrum is shown below. Determine the structures of compounds A and B. Let's use steps similar those outlined in problem 662 to solve this NMR structure elucidation problem. 1. Are there any hints? Yes, from the IR peaks. The starting material is a carbonyl (sharp IR peak at ~1,700 cm-1) and the product is an alcohol (broad IR peak ~3,300 cm-1). 2. How many IHD are in each compound? (also known as degrees of unsaturation or DBE). C6H12O is the same as C6H12 (ignore oxygen) which should be C6H14 if fully saturated (CnH2n+2). It's missing 2 hydrogens so C6H12O has 1 IHD. This 1 IHD must be the carbonyl. C12H18O is the smae as C12H18 which should be C12H26 if fully saturated. It's missing 8 hydrogens so it has 4 IHD. The benzene from the Grignard reagent must account for all 4 IHD. 3. Draw some C6H12O and C12H18O structures and elminate those that don't fit the data, then learn and repeat. The starting material is a carbonyl and we're adding a Grignard, so we expect the product to be an alcohol. 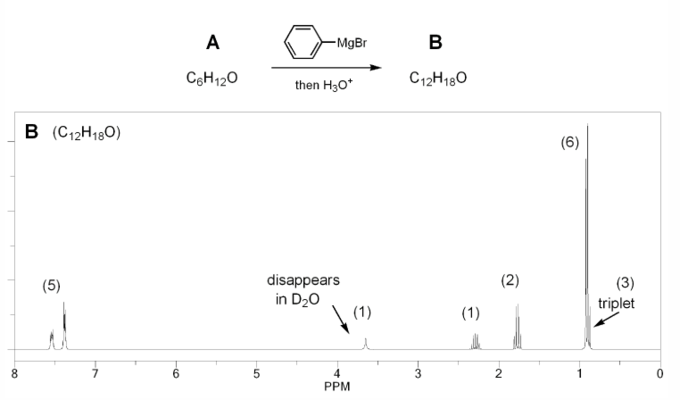 The NMR shows a peak that disappears with D2O addition, which also confirms that the product is an alcohol. The product must have a benzene ring because the reagent was phenyl Grignard. That accounts for the aromatic signals (~7 ppm) and the 4 IHD in the product. the NMR shows a doublet with an integration of 6 and a multiplet with an integration of 1. This is the splitting pattern on an isopropyl group. The NMR also shows a quartet with an integration of 2 and a triplet with an integration of 3. This is the splitting pattern of an ethyl group. 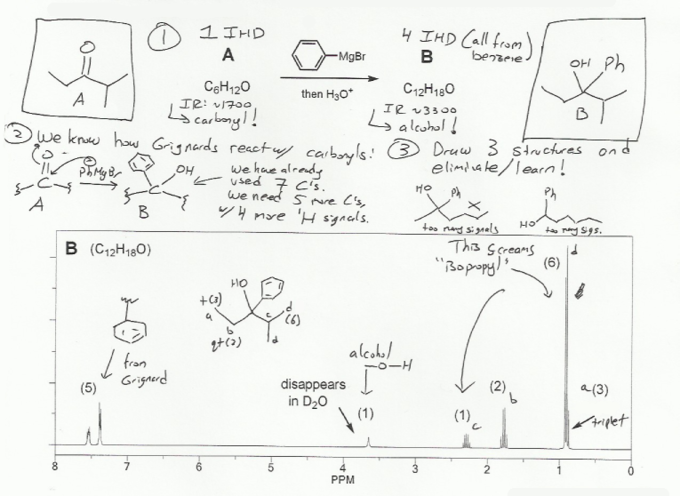 Once you have a few clues from the NMR, start drawing structures! And then elminiate those that do not fit the data (too many signals, wrong multiplicity/integrations etc.). MendelSet practice problem # 672 submitted by Matt on July 18, 2011.